Thanks so much to all of you for your warm welcome and especially to Jo - You have made my entry into blogland a smooth and comfortable one. I am really looking forward to making new friends and finding some local stitching friends. 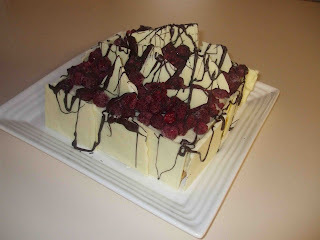 I thought I would post a picture of my White Chocolate and Raspberry Tiramisu that I made for our New Years Eve BBQ. I have just had another small bowl (Yeah right !) before I start the post Christmas diet on Monday. I am looking after my grandson (1 year old) tonight so no stitching for me but I will make amends tomorrow !!!!! Hey Jan I did giggle when you said about being brave displayiong my UFO's - That was just a very small selection LOL....... I have lots but 2009 is the year of FO - Finished Objects - Hopefully....... I intend to be very well organised for next christmas and as you can see from the previous pics I have a head start with some stitcheries. Hi Fiona and welcome to blogland. Tried to leave some comments yesterday but didn't work. Seems to be okay today. I'm sure you will find blogging heaps of fun and a great motivation to get those UFOs finished. Happy New Year. Hi Fee, Welcome to blogland. You have many kindred spirits here, especially with UFO's. Yummy, that dessert looks delish! Wow! That looks delicous. Welcome to Quilt bloggers. Hi and welcome to blogland. Jo told me to come over and say Hi and I am pleased to meet you ...and that gorgeous looking cake! Welcome. It's a great way to watch everyone's progress ad for motivation and encouragement. Have fun. Welcome to Blogland!! I hope you enjoy it - and might catch up in the Tassie Bloggers Get-Together maybe?? That Tiramisu looks SOOOOOO nice!! Hi Fiona and welcome to the blogging world from another Aussie. Have stacks of fun!! Now look... :D if you've got too much of that yummy cake left, send some in the post to me...lol...ha ha ha. I'll have a piece too...YYuuummmoo! Welcome to cyber world! Hope you will have lots of fun and inspiration! Fee - can't believe that delicious looking dessert! Welcome to the wonderful world of blogging - I too was introduced by the wonderful Jo in Tas (who is a work mate, we while away plenty of time talking sewing and scrapping etc).